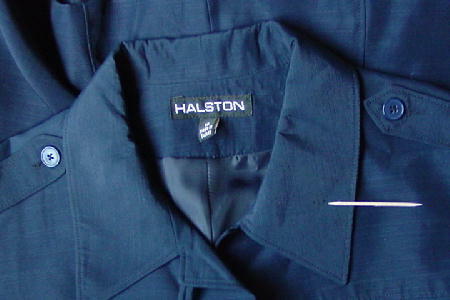 This vintage navy blue Halston blouse can also be worn as a lightweight jacket. 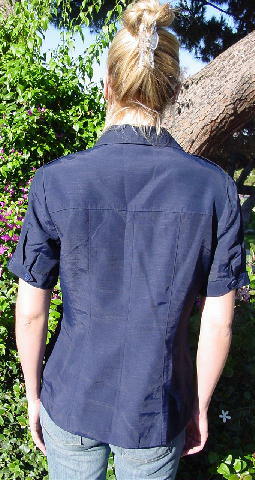 It has short sleeves and four buttons down the front (one of which is hidden under the collar). The left side of the collar has several pinholes and 3 tiny elevated threads (caused by a decorative pin). It is 94% rayon and 6% linen, and was made in Turkey. It has one button epaulets and two lower front angled pockets. Both the front and the back have a large yoke. 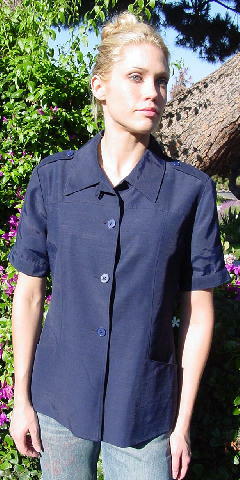 The short sleeves have a one button closure with a small open vent and one pleat. It has a very nice navy blue lining. It can be worn as a jacket too. shoulder to shoulder 16 3/4"